Has Prof. Steve Best breached ethical standards of academic conduct? to advance academic freedom and shared governance, to define fundamental professional values and standards for higher education, and to ensure higher education’s contribution to the common good. As colleagues, professors have obligations that derive from common membership in the community of scholars. Professors do not discriminate against or harass colleagues. They respect and defend the free inquiry of associates, even when it leads to findings and conclusions that differ from their own. In very simple words: it is not an academic right to harass or threaten a colleague simply because one disagrees with his/her ideas or line of research. Sadly, Professor Best, form the Department of Philosophy, at the University of Texas, El Paso, does not seem to grasp this concept. Apparently responding to external pressures, he now seems in a hurry to erase his past associations with animal rights extremists. In particular his collaboration with Camille Marino, of the web site Negotiation is Over. Despite efforts to bury the evidence of this association, bits and pieces continue to surface which have triggered growing community attention and concern. Here we provide two more examples. 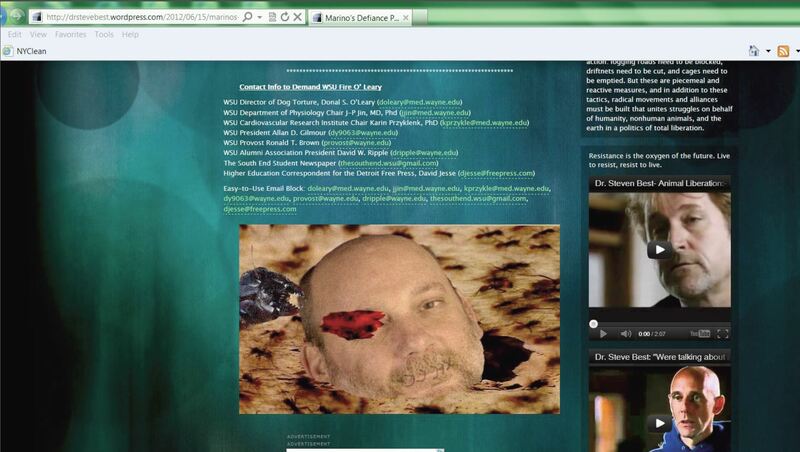 The first is an image captured from Prof. Best’s personal blog, showing he played an active part in the Negotiation is Over’s campaign against Prof. O’Leary at Wayne State University. Does anyone at UTEP or AAUP believe that publishing the imagery of a decapitated and mutilated academic colleague counts as a valid philosophical, argument against his work? Would it not be reasonable to suggest instead that the true intention of the image is simply to intimidate and threaten a colleague to comply with Prof. Best’s views and political positions? Given this evidence, along with the information linking his PayPal and email accounts to the NIO web site, is it not reasonable to ask if Professor Steve Best has breached the acceptable standards of ethical conduct as conveyed by the AAUP statement? Is it not time for AAUP, UTEP and his own Departmental colleagues to take a closer look at this important question? Addendum I: Camille Marino explains Prof. Best’s guidance of the Negotiation is Over organization. Steve Best is “the person who largely drove the direction of my organisation, Negotiation is Over”. 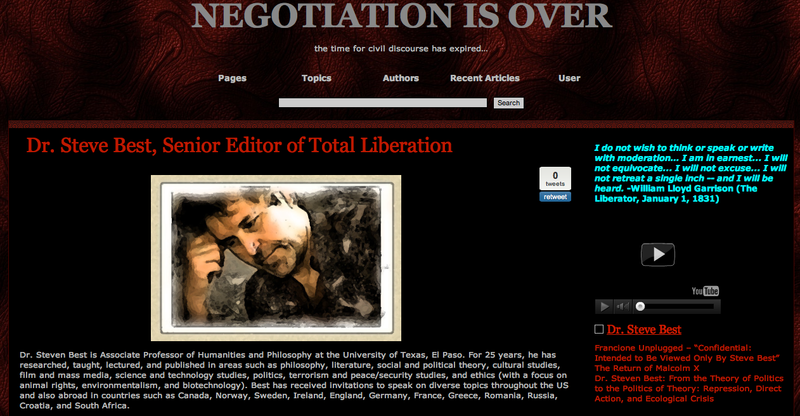 Addendum II: Prof. Best using his academic credentials as Senior Editor of Total Liberation for the Negotiation is Over Web Site. 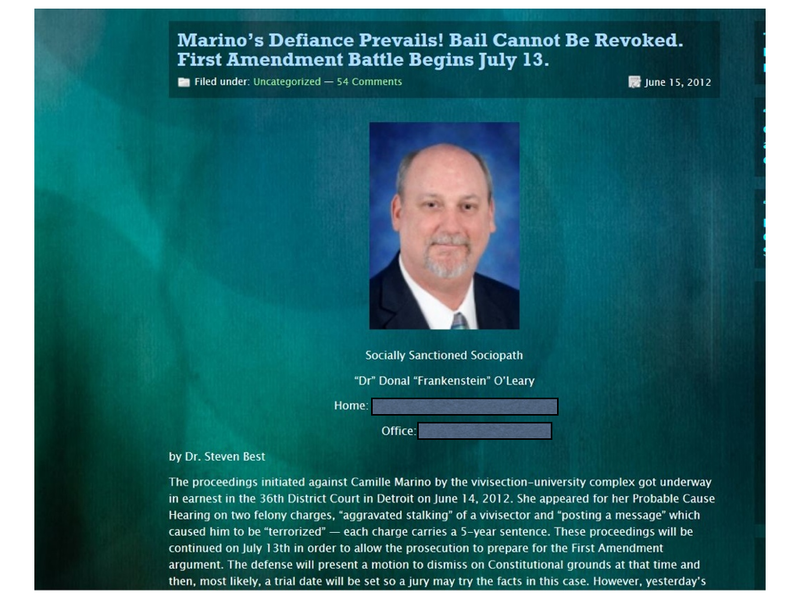 Addendum III: Marino publication of a how-to guide to anonymously harass investigators electronically during Prof. Steven Best tenure as Senior Editor of Total Liberation. 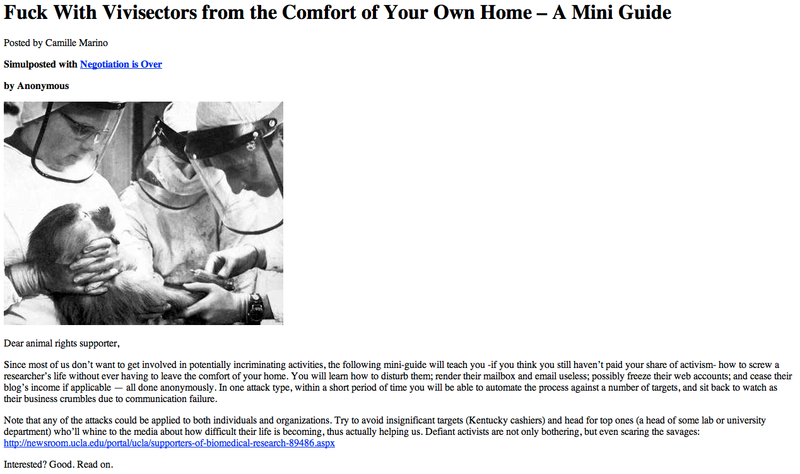 A how-to guide to harass individuals electronically published by Marino during the time Prof. Best was Senior Editor of Total Liberation at NIO. Posted on November 7, 2012 November 8, 2012 by EditorPosted in Animal Rights News, NewsTagged animal rights, Donald O'Leary, Steve Best, University of Texas El Paso, UTEP. Next Next post: Why do we use Genetically Modified animals? Barbie: “How can we support her [Marino]? Excuse me? “We” have raised money? Well… this sounds like a clear admission of financial support to me. And your request to help continue her campaigns make you not only an associate but an integral part of her organization. Shame on you and shame on UTEP! 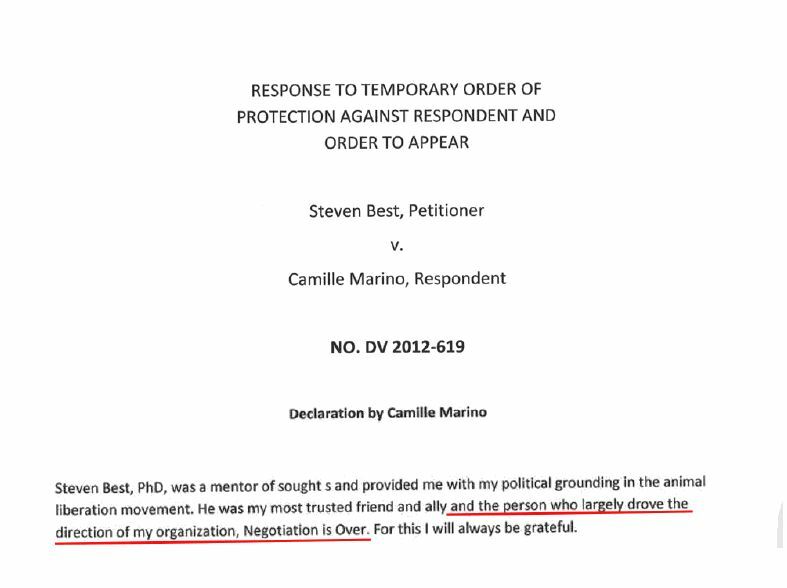 Prof. Best relationship with Ms Marino is clear in his interview with the Barbie Twins, where he also uses dubious “scholarly language” to refer to those he opposes. I agree. If the NHL, NFL and others can sanction their members for a tweeter line or coment considered inappropriate, shouldn’t Universities and places of higher learning do the same for their own supposedly well educated members who do even worse?